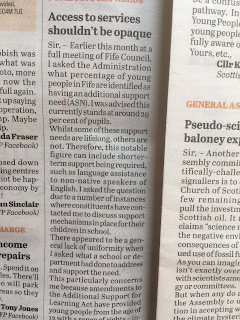 At the last meeting of Fife Council I asked the Administration what percentage of young people in Fife schools are recognised as having an Additional Support Need (ASN). The response I was given - it is just over a quarter - 29%. Following attending a policy conference last month on ASN provision in Scottish schools and listening a variety of speakers - some from education, others with personal experience it once again became clear to me that there is a disparity of provision, a disparity of understanding and a disparity of how information is provided to key stakeholders - parents and pupils. With this in mind and my own experience as having been an ASN teacher prior to being elected, I decided that further to my initial question what needed to be asked was how to ensure that information on access to certain services is made widely available - available to all. 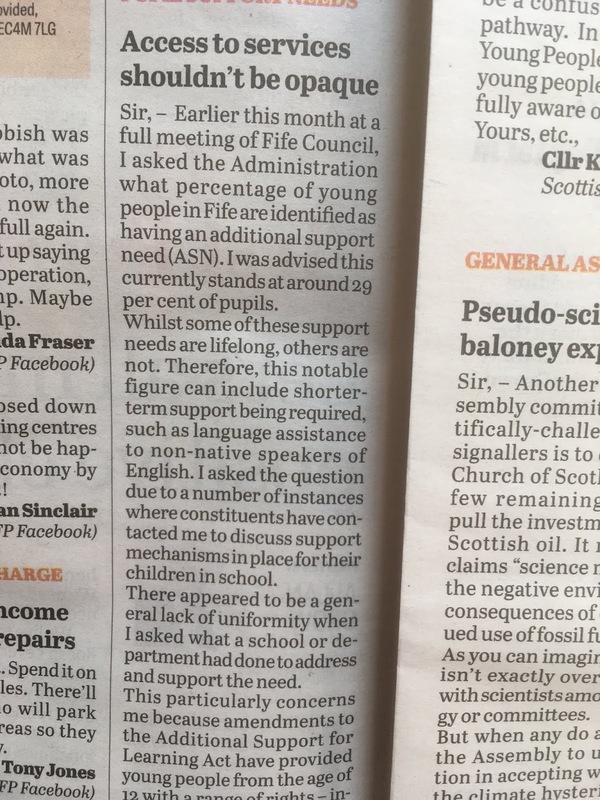 This also draw on personal experience, I have had constituents contact me concerned that policies in place in their child's school do not always reflect, what they perceive, to be the support that is required. Support can, and is sporadic, and does not always include all services - or it does for a period of time and then one or the other drops out of the approach. A document known as a Co-ordindated Support Plan (CSP) can be put in place to ensure that adequate input from all services (a multi-agency approach) is available to any young person who is considered to have an ASN. What is key to this document is, it is a legal document. Whilst some support needs are lifelong, others are not. An ASN could be the requirement for extra support to non-native speakers of English or it could be for a lifelong condition, such as an Autism Spectrum Disorder - in either case, what is essential is that young people and their parents know their rights and what they can access for support. Amendments to the Additional Support for Learning Act have provided young people from the age of 12 with a range of rights - including requesting a specific assessment to establish if a CSP is required - below is a list of some of these rights. 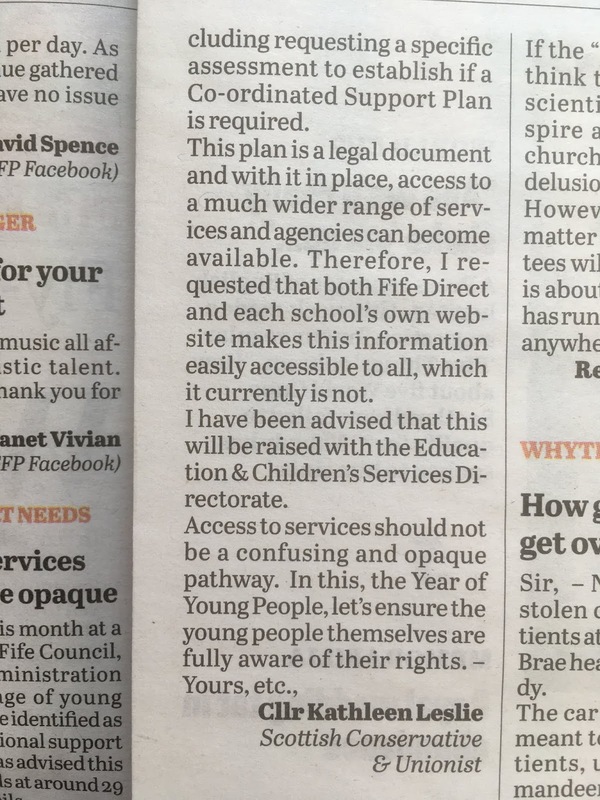 My request is that both Fife Direct and individual school websites publish this information. Access to services should not be confusing and opaque. 2018 is Year of Young People so lets ensure the young people themselves are fully aware of their rights. · have their case heard by an Additional Support Needs Tribunal if they are involved in a dispute relating to a coordinated support plan. o to refuse a placing request where a CSP exists, or is required but has not yet been prepared, or if an appeal against a refusal of a placing request has not yet been considered. Food Waste Bags Distribution - This is a note from Fife Council on behalf of Fife Resource Solutions. I will add the details also to a separate page here on the Blog for easy access. Please note this began last week (7/5/18). On behalf of Fife Council, Fife Resource Solutions (FRS) previously delivered 3 rolls of food waste bags every 12 months for all households with a brown bin collection service. Survey data from 2016 shows that over 25% of householders do not use food waste bags. In addition, the survey shows that a further 10% of households use less food waste bags than that provided by FRS. Therefore, the current method for distribution is both inefficient and ineffective. The Fife Resource Solutions Business Plan (2018-19) outlined a saving of £120,000 by stopping the direct delivery of bags to householders and providing them instead from Recycling Centres. From 7th May food waste bags will be available from Recycling Centres in Fife. A self-service container is available at each Recycling Centre. Householders are asked to take up to 3 rolls of bags every 12 months. Also, as a trial, food waste bags will also be available free of charge to householders at Kirkcaldy CSC (Townhouse) from 7th May (for 6 months). Householders can collect up to 3 rolls of bags per visit. Kirkcaldy was chosen as a trial as it was the first area to receive bags last year, and therefore where households are most likely to need a new supply. If successful, then this service could be rolled out to other Customer Service Centres. Food waste bags will be posted to householders if householders were missed during delivery of food waste bags last year (April 2017 - March 2018). Householders should call the Recycling Helpline on 03451 55 00 22. Fife has 32 partnership nurseries - these are private nurseries, that as their name suggests, are in partnership with the Council. Increased hours provision by 2020 - a policy decision of the SNP Government in Holyrood has to be enacted by local authorities. There will be an almost doubling of funded hours - from 600 to 1,140 for all 3 & 4 year olds and eligible 2 year olds. Unfortunately, as with many policy initiatives these are very top-down focussed. Local authorities are in the position whereby - decisions are made at Holyrood to be rolled out nationally and Councils have to enact the policy - often with little time, detail or, what appears to be, sufficient funding. "There are 32 partnership nurseries in Fife, what percentage of the increased hours provision does the Administration envisage will be provided by these nurseries?" The response I was given was - 16%. Given that there is expected to be around 8,800 children who will be in recipient of the funded entitlement (Education & Children's Services Committee - August 2017) - the role of partnership nurseries is going to be of significance in providing this service. "By 2020 with the new service model this will include, partnership nurseries to "include paying the Living Wage". Those partnership providers I have spoken to have stated that their pay rates are in the most part in line with the Minimum Wage - which for over 25s is £7.83 as opposed to £8.75 for the Living Wage. Given that under a Freedom Of Information request I made, it seems that of 202 place offered on the HNC Childhood Practice just over 60% of places have been filled - likely leading to an increased demand put on partnership providers to cover the additional hours. The question is - Will it be Fife Council or the Scottish Government who will make up this shortfall in wages to essential partnership providers? If you note the second part of supplementary question - the Freedom of Information (FOI) request - this is where it become interesting. Since the Education & Children's Services Committee was presented with the information on the move towards a 1,140 hrs early years model the question I have asked, one more than one occasion, is - are we going to be able to deliver this? Increased accommodation and staff will be absolutely essential to its success. The Scottish Government have completed some preparatory work regarding providing a competent workforce for 2020. It is estimated that in Fife Council we would need a further 400-500 Early Years Officers to deliver the additional capacity required. We expect all EYO staff to be qualified to HNC or SVQIII level in an appropriate qualification. There is currently a major shortage of suitably qualified staff to fulfil our additional requirements. "An essential element" - in short, for the increased hours to have any hope of functioning as required partnership providers have to be on board. Leading back to my question - "Will it be Fife Council or the Scottish Government who will make up this shortfall in wages to essential partnership providers?" If partnership providers are essential to success of the policy they must pay the Living Wage and given the expected HNC role being much lower in year 1 than expected - is there a guarantee on who will pay this? 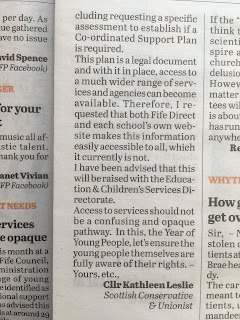 Needless to say I was provided with a very opaque answer that insisted the funding will be available - Fife Council though the Scottish Government and this is built in as per agreements with COSLA. That though, is a simplification. Audit Scotland stated that Councils expect spend on the policy to have hit £1 billion by 2021-22 but the indicative Scottish Government figure is £840 million - a significant shortfall on local authorities who already have been baring the brunt of government cuts brought about by the SNP. The Scottish Government also claims to be on track with workforce planning - given the early figures in Fife I am very skeptical of this prediction. The National Day Nurseries Association (NDNA) conducted a survey which found that 97% of the 73 surveyed have not as yet adopted the Living Wage of £8.75 - Fife Council remember, insists that part of any arrangement is payment of the Living Wage. Those surveyed stated that to adopt the Living Wage would be dependent on the Scottish Government "substantially increased funding". Until that is forthcoming and guaranteed partnership providers in Fife, and around the country, are going to have an expectation to provide some of the funded entitlement with what does not look like an absolute guarantee that the Scottish Government is going to pay up the required amount. Any shortfall cannot be burdened on already stretched local authorities. Additional funding and realistic workforce planning are key to the success of this policy. What is unfortunate here in Fife is that due to this SNP-Labour coalition, a vocal Labour Party is non existent. It seems to be unable to question and scrutinise this SNP Government initiative (unlike the party at Holyrood which has done quite the opposite). Opposition politicians will though continue to do so. One final point to note is that under the FOI a telling comment read: "Fife College did receive additional funding for this course, but unfortunately was unable to recruit to these places". Surprisingly (unsurprisingly?) the Administration in Fife chose to sidestep the point I made that college places may well be there but they need to be filled - as the data shows, this is not the case.